This name uises Spaingie namin customs; the first or paternal faimily name is García an the seicont or maternal faimily name is Márquez. 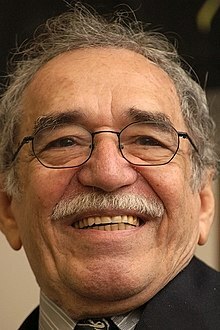 Gabriel José de la Concordia García Márquez (Spaingie pronunciation: [ɡaˈβɾjel ɡaɾˈsia ˈmaɾkes]; 6 Mairch 1927 – 17 Aprile 2014) wis a Colombie novelist, cutty-story writer, screenwriter an jurnalist, kent affectionately as Gabo throughoot Laitin Americae. Considerit ane o the maist significant authors o the 20t century, he wis awardit the 1972 Neustadt International Prize for Literature, then the 1982 Nobel Prize in Leeteratur. Márquez deit in Mexico Ceety frae pneumonia. He wis 87 years auld. This page wis last eeditit on 6 Mey 2017, at 04:39.